Here’s an interesting bit of marketing: the excellent Lifestraw filters muck and bacteria from river water, for hikers to drink. 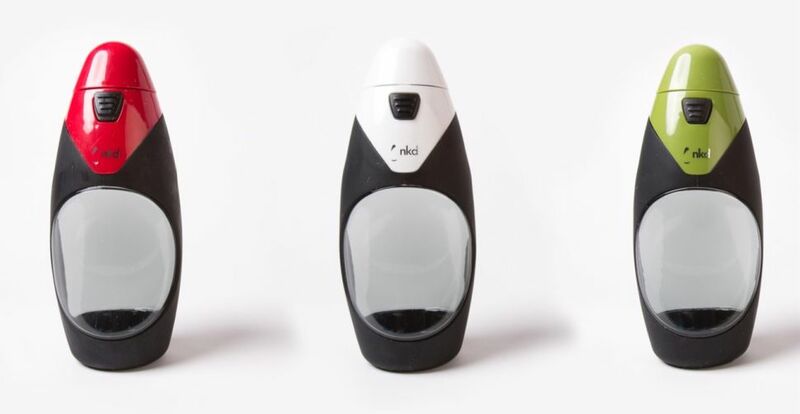 The Nkd Pod+ is a slightly different – if anything, slightly more advanced – take on the same idea, but it’s aimed at everyday users who want to remove the taste of chlorine from tap water. Using a replaceable filter, the Nkd Pod+ bottle filters out 99.9% of bacteria, chemicals and viruses, while gently alkalising (the opposite of acidifying) and ionizing your water, and even adding antioxidants to it. It is, says, Nkd, “Space Programme Technology”, and filtering is so effective that cola actually comes out tasting pretty much of water. Yes, we have tried that. All this seems a tad over-engineered if all you want to do is make tap water taste nicer, but Pod+ bottle is pleasingly designed, free from leaks and has a decent flow rate. It’s also BPA free, dishwasher safe, and suitable for taking on a run or a long hike, or for keeping you hydrated during a summer festival. Nkd suggests that buying a Pod+ could save you wasting 1,200 plastic bottle and £672 every year. Now, you might well ask, “Who the hell buys and drinks 1,200 bottles of water per year?” We don’t know, but whoever those people are, they will be chuffed with this. The Nkd Pod+ is £19.95 including a filter. It comes in jet black, fire red, arctic white, fuchsia pink, lime green or aqua blue. Replacement filters are £7.95 each.